First of all, let me just say I was hyped to watch a movie I'd only heard about, thinking it was a romantic comedy starring Lucy Liu and Taye Diggs. Yay, more Asian representation! 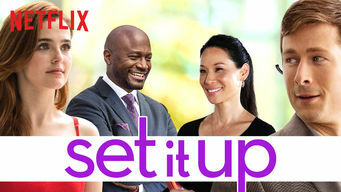 Except, um, it's not a movie starring Lucy Liu and Taye Diggs. I mean sure, Netflix puts a picture of them on its banner, but they're just trying to lure you in for a romantic comedy about two other people you've never heard of. So there's that. But it's cute! Granted, I'm a sucker for rom-coms, but even the fact I spent a fair amount of time deciding what bigger name actors they reminded me of didn't overshadow my enjoyment of it. (For the record, it's fake Anna Kendrick meets Mae Whitman for the girl, fake Colin Jost for the guy.) The whole sucky-assistant job premise brings back shades of The Devil Wears Prada, but without the sucky, judgmental friends! (Anne Hathaway's boyfriend in that movie was the absolute worst. This is not up for debate.) Plus, Lucy Liu's character is a badass sports entertainment exec, so really, what's not to love? It has all the hallmarks of a predictable-yet-enjoyable rom-com: cute banter, hilarious awkward moments (I will never look at another delivery person in an elevator the same way again), and of course, the dramatic breaking point. It's all there. So while this isn't the most inventive rom-com, it certainly ticks all the boxes. And it was pleasant enough to convince me to add The Guernsey Literary and Potato Peel Pie Society (which Glen Powell is in) to my watch list. Final word: More movies with Lucy Liu, please. And have her be the actual star next time.